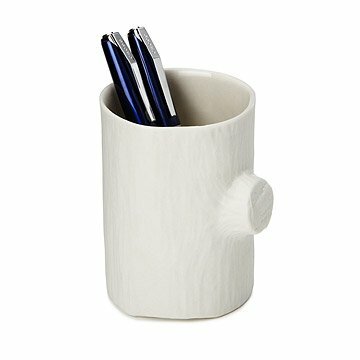 Featuring a faux bois texture, this porcelain piece holds your office supplies with woodland charm. In a vast sea of desks, cubicles, and keyboards, it's refreshing to see an organic form under the florescent lights. Beautifully crafted with a realistic faux bois texture, this porcelain piece holds your office supplies with charming woodland intrigue. Handmade by Michiko Shimada in Brooklyn, New York. Michiko Shimada is a Brooklyn based product designer. Originally from Japan, she attended Parsons School of Design where her interest grew toward the beauty of hand crafted ceramics. After graduation, she worked as a tableware designer for a ceramic manufacture in NY for several years until she changed her focus on her own line of handmade ceramics. Since 2009, she was been working in her Brooklyn studio specializing in slip casted ceramics. Her work conveys simplicity, practicality and beauty with a just a touch of whimsy. Valuing craftsmanship, every process from model making to finished pieces are carefully carried out by hand in our studio. We are passionate about creating products that connect with our customers on a deeper level. Products that possess 'something special'. They're created with the hope that they stay with and are valued timelessly by our customers. 4" H x 2.75" diam.